Microwave ovens can be quick and convenient to use, but easy access poses a danger to children. Toddlers as young as 17 months can start a microwave, open the door and remove the contents, putting them at risk for burn injuries. Even if a microwave is placed up high, a child may climb on furniture or other objects to reach it. "Microwave safety often is overlooked because the ovens are not viewed as dangerous," said Kyran Quinlan, M.D., FAAP, a member of the American Academy of Pediatrics (AAP) Committee on Injury, Violence and Poison Prevention. 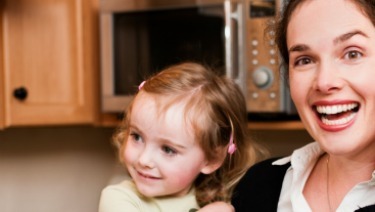 "Families need to see that very young children are able to access and open a microwave. It's one of the biggest ways that kids are burned; some of them are serious burns," he said. Most of the kids who end up in burn units were not burned in fires; they were burned by food or something involving the preparation and consumption of food. About 155,959 microwave-related injuries were treated in U.S. emergency rooms from 1990 through 2010, according to national data. Almost three-quarters of injuries to children younger than five were burns. Patients usually were injured by spilled hot water or food, a splash or explosion, or contact with a hot item. Children also can be burned when opening microwave popcorn bags and other containers, or eating food that is cooked unevenly. No safety measures exist to protect kids from microwaves. Parents need to be vigilant and be aware that this is a real risk in their own homes. Follow the manufacturer's instruction manual for recommended operating procedures and safety precautions. Stir food well or let it stand for two minutes before tasting it so the heat can distribute evenly. Make sure young children cannot reach the microwave. If children are too young to follow written directions, they are too young to use a microwave oven without supervision.